Are there signs of greater turnover in your customer base, or more competitors in your industry than ever before? Is your top line getting hammered at the same time that your costs keep going up? Are your products or services becoming a commodity in an increasingly complex marketplace? Have you been so focused on managing costs that you’ve forgotten how to grow the business? These are all signs of the increasing dysfunction that exists in the world of business : far too many organizations subsist in a stunning state of complacency as the world evolves around them at a very rapid pace. As the future becomes more challenging, it is a good time to take some positive steps : change your actions, attitudes and approaches, so you can manage change before it continues to manage you. 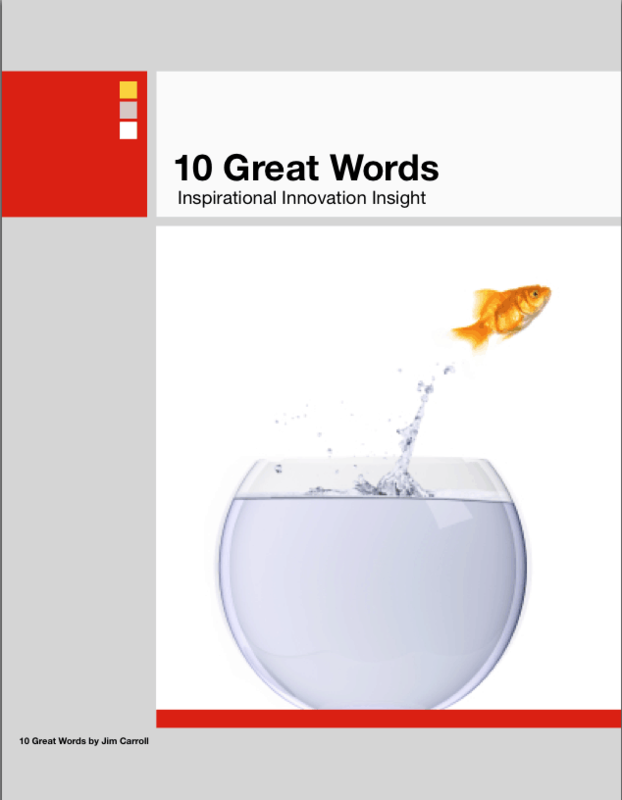 Grab the 10 Great Words document – it’s a PDF –click to view and share it around! Here’s Jim Carroll on stage in Sydney, Australia, speaking to an audience about why the ’10 Great Words’ can be such a powerful force for innovation. Adopt ten simple words that will help to get you into the right frame of mind. Think. Analyze your observations: spend more time learning from what you see happening around you. If you are like most organizations, you are responding to trends on a short term, piecemeal basis: you are reactive, rather than proactive. Step back, take a deep breath, and analyze what trends are telling you. From that, do what really needs to be done. Change. In a time of rapid change, you can’t expect to get by with what has worked in the past – you must be willing to do things differently. Abandon routine; adopt an open mind about the world around you. The world is changing at a furious pace whether you like it or not. Take a look at how you do everything – and decide to do things differently. Dare. Have you lost your ability to take risks? Likely so – in the last year, we’ve seen the phrase — risk management” take on huge importance, as organizations have rushed out to hire — Chief Risk Officers” so that they can deal with the compliance requirements of the — Sarbanes-Oxley” legislation. Yet at the same time that you work to manage and minimize risk, your market is changing, your customers are abandoning you, and your margins are shrinking! Aren’t these the biggest risks to manage? Taking risks is critical to your future success – don’t throw this critical innovation baby out with the compliance bathwater. Banish. Get rid of the words and phrases that steer you into inaction and indecision. Drop buzzwords: seek real solutions to real business problems rather than trying to run your business based on simplified pap. Ban complacency: shake your people up with some pretty dramatic action. Kill indecision: force your team to make decisions based on gut feel rather than over-analysis of dubious spreadsheets. Try. How many of your people have lost their ability to adapt to changing circumstances because they’ve lost their confidence? Developing new skills and career capabilities is critical, given the rapid change occurring in every profession. And yet, too many people have managed to convince themselves that they can’t adapt; they can’t change; they can’t master the new realities that surround them. They’ve lost their self-confidence, and they desperately need it back. Solve this problem fast. Empower. In a world of rapid change, you can’t expect that rigidly defined rules will be the appropriate response to changing circumstances. A ticked off customer needs a solution right now from a front line customer service rep – not some type of follow-up from head office weeks later. A middle manager in a remote location needs the ability to make a decision and must commit to it today – they can’t afford to wait for the wheels of head office bureaucracy to churn. Destroy the hierarchy, and re-encourage a culture in which people are given the mandate and the power to do what’s right, at the right time, for the right reason. Question . Go forward with a different viewpoint by challenging assumptions and eliminating habit. If your approach to the future is based upon your past success, ask yourself whether that will really guarantee you similar results in the future. If you do certain things because — you’ve always done it that way,” then now is an excellent time to start doing them differently. Grow. Stop focusing on cutting costs – build the business instead. Don’t stand in fear of what you don’t know -teach yourself something new. Don’t question your ability to accomplish something great – grab the bull by the horns and see what you can do! The point is, in a world of rapid change, you must continually enhance your capabilities and opportunities through innovative thinking. Change your attitude now, and the rest will come easily. Do. Renew your sense of purpose, and restore your enthusiasm for the future by taking action. Too many organizations, and the people who work within them, are on autopilot. They go into work each day, and do the same things they did the day before, with the belief that everything today is the same as it was yesterday. It isn’t. Rapid times require bold change; action is critical. Maybe 10 simple words are enough to get you started on the right track.